The #1 Bestseller, Avoiding a Legacy Nightmare, helps you start a conversation with clients about what their legacy means to them and what they want it to accomplish. More than that, it’s a simple guide to help them get started in creating an effective estate plan that achieves all that they intend. Plus, it will help you identify additional sales opportunities. 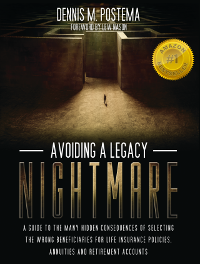 You can purchase Avoiding a Legacy Nightmare for $12.00 each, and you will get one free copy for every two you order until 12:00 pm EST, December 31, 2014! Order 2 and get 3! Order 4 and get 6! Order 6 and get 9! Please complete the below form, and one of our specialists will call you within one business day* to confirm your order. *Please note the PMG office will be closed 12/24, 12/25, 12/31, and 1/1. “It is estimated by Probe: The Insider’s Newsletter for Financial Industry Insiders, a 66-year-old publication that has endorsed and recommended this volume, that the designation of beneficiaries is the number-one area that advisors make their most frequent and critical mistakes, leaving their clients with the horrid penalties.